Other versions of Jane have been filmed there before. I'm going to try to get the book soon, too. I think we're going to see a lot of kissy face, penetrating stare fierce touching Michael, kids. Mmmmm! SEEMS you can hardly walk down a Derbyshire country lane these days without falling over a new film or TV production of Jane Eyre. There's great excitement over at Fox House and Froggatt with the filming of Cary Fukunaga's version starring Mia Wasikowska (she was Alice in Wonderland) and Michael Fassbender as Jane and Mr Rochester. Seems like only yesterday (2006) that Ruth Wilson and Toby Stephens were filming it in these parts and then there was Zeffirelli version with Charlotte Gainsbourg in 1994. This will be the 23rd film or TV version of the novel since 1914. Judi Dench will pop up as Mr Rochester's housekeeper. When the actors were first seen in costume one subscriber to the Sheffield Forum website wondered whether they were filming Lark Rise to Grindleford! HOLLYWOOD stars will be in Derbyshire again as parts of a new adaptation of classic novel Jane Eyre are filmed in the county. Dame Judi Dench and Billy Elliot star Jamie Bell are among the cast for the new movie. The locations for filming have yet to be confirmed, but the cast and crew will be staying at a working museum near Matlock while shooting takes place. Red House Stables, in Darley Dale, will provide accommodation for both horses and humans while filming is under way for the period drama, based on the 19th-century novel by Charlotte Bronte. The building houses a large collection of original horse-drawn vehicles and equipment and, as a working museum, regularly takes them out on the road. The size of the collection and working order of the equipment has led to the place developing a growing sideline in providing props and horses for film-makers. Caroline Dale-Leech, owner of Red House Stables, said it was not the first time the company had worked with a film crew. She said: "We have been operating as a museum since 1946 and have helped with plenty of films before. "But we are always happy to accommodate them. Normally they use our horses and carriages in the films but this time they have their own so we will just provide the horses and crew with somewhere to stay. "We are catering for up to 16 people and 16 horses and they will be staying over the next few weeks, but numbers will vary as filming changes." She said the stables had been involved with film companies since the 1960s. Over the years, Caroline said they had helped in the making of Chitty Chitty Bang Bang, the BBC TV version of Pride and Prejudice, films based on DH Lawrence's novels Sons and Lovers and Women in Love and TV show Peak Practice. She said: "We also do all sorts of promotions and advertising. We have built up a good reputation and it is a unique selling point. "On the back of our work with films, especially after the BBC's Pride and Prejudice series, we had people from as far as Japan come and visit on tours especially to see us." The film, which started shooting last month, is being produced by Ruby Films and funded by BBC Films and Focus Features. It is being directed by Cary Fukunaga, who recently won the Dramatic Director award at the 2009 Sundance film festival for his previous film Sin Nombre. It will star Mia Wasikowska, recently seen in Tim Burton's Alice in Wonderland, as Jane Eyre and Michael Fassbender, who has worked with Quentin Tarantino in Inglourious Basterds, as the brooding Mr Rochester. Christine Langan, creative director of BBC Films, said: "We're delighted to bring together two such fresh and impressive talents as director Cary Fukunaga and screenwriter Moira Buffini. "Added to the gorgeous cast Cary has assembled, this is exactly the treatment Charlotte Bronte's evergreen classic Jane Eyre deserves." 1 reader has commented on this story. TWO Derbyshire stately homes will be used to film scenes for a new Hollywood movie. Chatsworth and Haddon Hall will both be featured as locations in Jane Eyre, a new production of the classic novel by Charlotte Bronte. Stars appearing in the film include Dame Judi Dench and Jamie Bell and shooting will take place over the next few weeks. Yesterday the Derby Telegraph revealed that the movie's stars would be staying near Matlock during some of the filming. Now Ian Thompson, publicist for Ruby Films, which is producing the film, has confirmed the filming locations. He said: "Along with Chatsworth and Haddon Hall we are also shooting some scenes in the Derbyshire Dales. "It's not hard to point the camera somewhere in Derbyshire and for it to look stunning. "It's the untouched rural beauty of the region and the stately homes that makes it perfect for shooting period films." 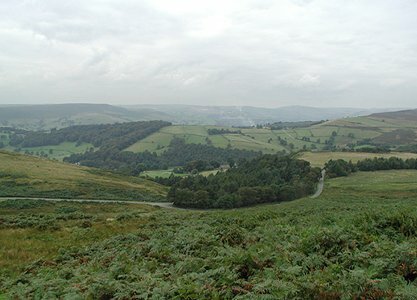 In the past, films such as The Wolfman and The Duchess have been shot at Chatsworth, attracting stars such as Benicio Del Toro and Keira Knightley. James Trevethick, head of house operations at Chatsworth, said: "It's not only a tourism boost to the estate but it celebrates the beauty of the place. "We are only involved in a few minor scenes but we are always glad to welcome a film crew." Red House Stables, in Darley Dale, will be providing accommodation for both horses and humans while filming is under way. Caroline Dale-Leech, owner of Red House Stables, said: "We are catering for up to 16 people and 16 horses and they will be staying over the next few weeks but numbers will vary as filming changes." More pictures at above site. "Good weather and obliging wildlife allowed the last day of filming for Jane Eyre at Stanage Edge on our North Lees Estate yesterday"
March 1, 2011, 5:45 a.m. Marking the March 11 opening of the new film adaptation of "Jane Eyre" from the novel by Charlotte Bronte, VisitBritain has created a free Jane Eyre/Bronte Country destination pocket guide. "Jane Eyre," which was published in 1847, tells the story of a young orphan who suffers injustices, grows into a young woman of strong moral character and eventually weds her true love. It has been made into numerous movies and TV miniseries, including a 1910 silent film and a 1996 big-screen version starring Anna Paquin, William Hurt, Joan Plowright and Geraldine Chaplin. The VisitBritain guide, which contains suggested itineraries and tips on following in the footsteps of the Bronte sisters (Emily wrote "Wuthering Heights") and their famous characters, is available at selected Barnes & Noble bookstores or by mail through travelinfo@visitbritain.org. Or it can be downloaded online from VisitBritain’s special website. Besides the downloadable brochure, the website also contains the movie trailer, starring Mia Wasikowska ("Alice in Wonderland") and Michael Fassbender (Inglourious Basterds), behind-the-scenes information about film locations, maps, hotel suggestions and a calendar of upcoming Bronte-themed events. To learn more about the film, go to www.JaneEyreTheMovie.com. THE latest big screen version of Jane Eyre is set to have a dramatic impact on one of the area’s most historic houses. But it is the garden rather than Haddon Hall itself that is being transformed thanks to location fees paid by makers of the film, starring Mia Wasikowska and Michael Fassbender, which is due for release in September. Haddon, acknowledged as England’s most perfect surviving medieval house, is being gradually restored under the care of its present incumbent, Lord Edward Manners. But the famous terraced gardens have received little more than basic maintenance over the last century – until now. All visitor income is ploughed back into the upkeep of the property, near Bakewell. But Haddon’s latest appearance as Thornfield Hall has brought a welcome boost to the coffers, enabling work to begin on a three-year replanting project. Acclaimed garden designer Arne Maynard is in charge. He believes a garden should draw out the essence of its setting. In Haddon’s case, that includes restoring elaborate Rennaissance gardens which have lost much of their character. His solution is to create a modern interpretation, echoing the Elizabethan hall but at the same time seating it firmly in the local landscape. Work has begun on the Fountain Terrace. More than half the profusion of roses and delphiniums have been removed, along with anachronistic colours. In their place are herbaceous borders in shades of pink, blue and heathery mauve. A flowery mead, studded with wild orchids, aquilegia and other native flora, resonates with the open countryside beyond. In the centre of the garden the corners of the fountain pond have been bracketed by cubes of copper beech, a trademark of Arne’s work. Next year the focus will switch to the upper Bowling Terrace, where a knot garden will be restored with traditional plants used for eating, medicinal purposes or even dying cloth. And in 2013 the lower and upper terraces will be replanted with meadow species and fruit trees. Lord Edward admits he is no gardener – “Don’t ask me anything about flowers!” – but he loves gardens and is pleased with the results to date. The public can see the work in progress this year. There will also be a chance to see some of the grounds for the first time during garden open days each Friday until the end of September. “For example it means they can now walk down to the river and over Dorothy Vernon’s Bridge,” says Lord Edward. Haddon Hall is open noon-5pm daily. THE Peak District is bracing itself for a tourism windfall following next week’s release of Jane Eyre. The box office heavyweight – starring Michael Fassbender, Mia Wasikowska, Jamie Bell and Dame Judi Dench – has been filmed on location around Haddon Hall and is expected to bring sightseers flocking to the area. Last year around 36 million tourists visited the Peak, bringing in more than £1.5 billion. And as the region gears up to cash in on next year’s Olympics, the role of big screen exposure is not underestimated. Recent hits which have brought film fans flocking to the area include Pride & Prejudice, The Duchess, The Other Boleyn Girl and Robin Hood. 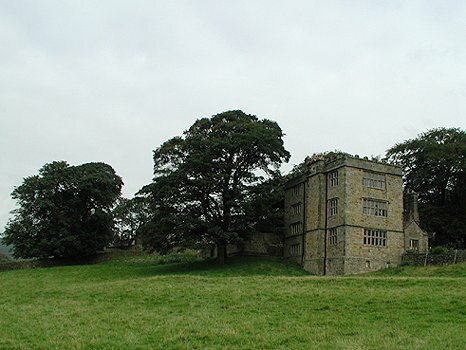 Medieval Haddon was the obvious choice when director Cary Fukunaga was looking for a suitable Thornfield Hall. Charlotte Brontë visited Hathersage in 1845 and is thought to have based much of her novel on landmarks she encountered in the area. Haddon is no stranger to the role – it was cast as Thornfield by Franco Zeffirelli in 1996 and ten years later in the BBC version. This time more than 100 cast and crew transformed the building, with scenes being filmed in the minstrels’ gallery, the state bedroom, the kitchen and even the private apartments. Jo also found herself cast as impromptu props assistant: “I made some tatty curtains to go on the windows of the Long Gallery, which was being made to look like an attic. And she was party to some of the film’s secrets, such as the hundreds of tiny fabric blossoms that were fastened to bare trees in the garden to make it look like spring. The cast and crew were billeted at various locations during the four weeks of filming, with many of the stars staying at the nearby Peacock at Rowsley. “They’re all lovely but we especially loved having Dame Judi; she’s a national treasure,” says Jo. Haddon is only one of the Peak District locations to be featured. The result is said to be darker than previous interpretations. But The Times reports that it is ‘a handsome and satisfying version that makes the landscape as much a star as the excellent leads’. Other locations include the ruins of Wingfield Manor near Alfreton, which double as Thornfield after it is ravaged by fire, and White Edge Lodge – a former gamekeeper’s cottage, now a National Trust holiday home on the Longshaw Estate – which serves as The Moor House. And the wild romantic landscape that first inspired Charlotte Brontë is allowed to speak for itself. 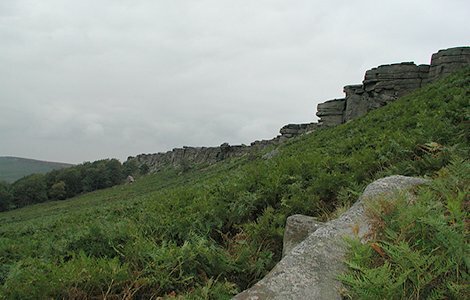 Stanage Edge, one of the area’s most dramatic natural landmarks, has been chosen to capture Jane Eyre’s profound sense of isolation. The area around her school is filmed near Edale and the softer countryside where Rochester rides around Thornfield is represented by the lush water meadows below Haddon Hall. All these sites are likely to sought out by visitors and so-called ‘film tourists’ who are expected to flock to the area over the coming months. Jane Eyre is due for UK release on Friday, September 9. The director of the latest version of Jane Eyre to hit the silver screen was in West Yorkshire last night for a special screening of the film. Cary Fukunaga was at the Bronte Parsonage in Haworth, home to Charlotte Bronte, the famous author of Jane Eyre, for a first showing in the United Kingdom of his adaptation of the book. And the 34-year-old from California said he was pleased how his version of the classic story had made it to screen. The film, starring Mia Wasikowska as Jane Eyre and Michael Fassbender as Edward Rochester, has received favourable responses in America, where it was released earlier this year. And Mr Fukunaga said he was pleased to be back at Haworth having visited in late 2009 to try to get a sense of Charlotte Bronte before filming began. He said it enabled him to realise the “space” of the world Charlotte Bronte and her famous siblings, Emily and Anne, inhabited when the book was published in 1847. “It’s inevitable the film is going to be compared to others,” he said. The film goes on general release across the UK on Friday with special screenings on Wednesday at the Picture House cinema in Keighley.